This work is concerned with study of potential for Hoyer Global Transport an international tank container transpiration company to enter market for import and export of fine liquid chemicals to and from Russia. Therefore, research on the Russian market for import and export of liquid chemicals and raw materials was conducted. The main goal of this research was estimate potential for import export moves generation; however as demand for transportation is a derived demand one had to study and estimate demand for the final products and end users markets. For this purpose this final product and end users markets had to be identified by means of investigative marketing applied to the information extracted from HGT shipments data base for the period of 2007 to 2010. 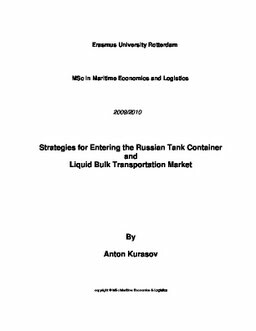 Successful combination of methodology, good levels of data availability and a lot of vigor for research resulted in identification and general estimation of the markets with the most potential to be the driving force behind demand generation for import and export moves of liquid chemicals in tank containers to and from Russia on behalf of HGT. Among major discoveries is that the greatest potential driving force for demand for fine chemical transportation is generated by growing consumption in the Russian domestic markets for personal care, cosmetics, household cleaning items, and detergents as well as some solvents; The second place for the potential growth is occupied by Russian pharmaceuticals market. One has to indicate an interesting finding of export import dynamics that is reflected in a basic ―import some to export more‖ which works in both directions, as Russian plastics and rubber producers as well as paper and pulp producers import some fine chemicals used in the production of the products that will be exported from Russia afterwards. Plus there are several main stays of Russian chemical industry as fertilizers and rubber plus initial upstream production and oil and gas refining industries that might use some imports to give large amounts of exports; However, even on the export side there are interesting finding regarding potential of export of very highly sophisticated products that used in production of rubber, which were probably developed on the basis of many years of mass rubber production in Russia. Thus, those chemicals have a good potential to be exported to the Global markets including USA, EU and Asia on a rather large scale and demand for their transportation should be certainly tapped by HGT.